With a long knife cut a two inch slit in the center of the pork loin. If you knife isn’t long enough flip the pork around and cut a slit on the other side so both slits meet. This will be the pocket that you will place your stuffing. Season the pork with salt, pepper and garlic. In a hot saute pan with 2 Tablespoons of oil, sear all sides of the pork until browned. Remove from heat and set aside. In a mixing bowl, add diced pears, Palmetto Cheese and breadcrumbs. Mix thoroughly. The breadcrumbs are used to bind the mixture together and keeps the cheese from coming out of the loin when roasted. On a counter or cutting board, lay out bacon slices side by side until it is the width of the pork. 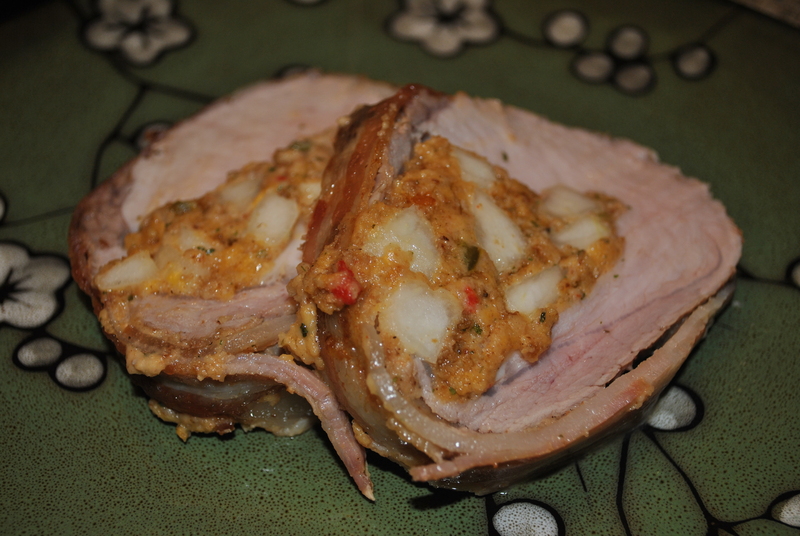 With a small spoon or using your hands, place stuffing into the slits you created in the center of the pork. All stuffing should fit inside of your pork. Lay the stuffed loin on bottom edge of the bacon. Wrap the bacon around the pork loin and place the seam side face down onto a roasting pan. This will prevent the bacon from unwrapping itself. Place in a 375 degree oven for approximately 1 hour. Pull from oven and let rest for at least five minutes before slicing. For easy slicing, use a bread knife or large serrated knife.